Over the past few weeks there have been a couple of thought provoking developments in the mHealth market. The first event was the withdrawal of two recently launched mHealth services by O2 UK on the grounds that there was inadequate consumer demand. The second event relates to Verizon Wireless which obtained FDA approval for its mobile health remote monitoring and personal health data platform. These developments prompted me to revisit some earlier work I did on the value proposition in mHealth. In particular, I was investigating whether remote monitoring is actually a relatively minor, but necessary, element in the business model. My earlier work focused on diabetes care although I suspect that the arguments carry over to other chronic health conditions. In late July 2013, O2 UK’s Health group decided to stop selling its telecare (branded “Help at Hand”) and telehealth (branded “Health at Home”) services. According to published reports, Help at Hand was a GPS-enabled device with a support button, four quick call buttons and a fall alarm. Falling or pressing the blue button would put the device into speakerphone mode and also connect the user to a call center. O2 described Health at Home as a complete service that includes a secure software platform for health care professionals (HCPs) to remotely monitor their patient’s health, and a range of everyday mobile devices that patients use to monitor their symptoms. The service was available on a wide range of computers, tablets and smartphones. Health at Home was designed to integrate seamlessly with existing IT systems and equipment within health care organizations. Verizon Wireless’ announcement was to publicize the fact that it had obtained FDA clearance for its mobile health platform. This supports a remote monitoring software solution to collect and store biometric data from physiological measurement devices (e.g. blood pressure cuff, glucose monitor, pulse oximeter, weight scale etc.) intended for use in the home. Remotely monitored data is automatically transmitted to a remote secure server via embedded cellular and is accessible by both patients and providers for review purposes. It appears that Verizon did not plan to market health services directly to consumers via the Verizon Wireless brand. Its overall strategy is to develop a suite of tools and services that build a home-based care and health care monitoring system for use by health-care providers. DAFNE (Dose Adjustment for Normal Eating)  – this program focuses on people living with Type 1 diabetes and health care sector professionals. Its strategy is based on patient education as the basis for diabetes care in clinical practice and research. DAFNE was developed from a protocol developed in Germany; it was imported to the UK by an initially skeptical research team. DESMOND (Diabetes Education and Self-Management for Ongoing and Newly Diagnosed)  – this program aims to improve opportunities for learning and support for people with diabetes or the risk of developing Type 2 diabetes and the health care professionals involved with them. It is interesting to note that both of these initiatives focus on patient education. This then givens rise to a set of support requirements related to patient data and regular (remote) monitoring. This causality can be seen in an observation from a DESMOND program attendee. "I found the course very interesting. For the first time I understood the effect of diabetes and the pills I was taking on me. I began to understand the difference between food groups and I began to experiment with food and monitor their effect on my blood sugar levels. The course also taught me the relationship between exercise and diabetes. I now go to the gym 4 times a week and walk on others. I know how long it would take me to work off a piece of cake or a chocolate bar! I now understand the value of education in managing my diabetes and my weight. DESMOND has taught me to record and monitor daily, monthly and annually so I can learn from experience”. Notwithstanding these comments and the successes of DAFNE and DESMOND, the UK health care system still faces significant challenges. A recent audit  of diabetes care in the UK’s National Health Service (NHS) concluded that “Diabetes care in the NHS is poor, with low achievement of treatment standards, high numbers of avoidable deaths and annual spending reaching an estimated £3.9 billion”. The audit report highlighted the fact that demand for diabetes care continues to grow. Amongst several recommendations, it highlighted the need to overcome the variability of care received by people with diabetes and to ensure that people with diabetes are offered education and support in how best to manage their condition. The NHS experience reveals a number of possible value propositions in developing mHealth solutions for chronic care. At a macro level, there is a need for standardization and consistency of care. Conceptually, this is not dissimilar from the standardization challenge that the mobile industry resolved decades ago beginning with GSM and subsequent generational advances. 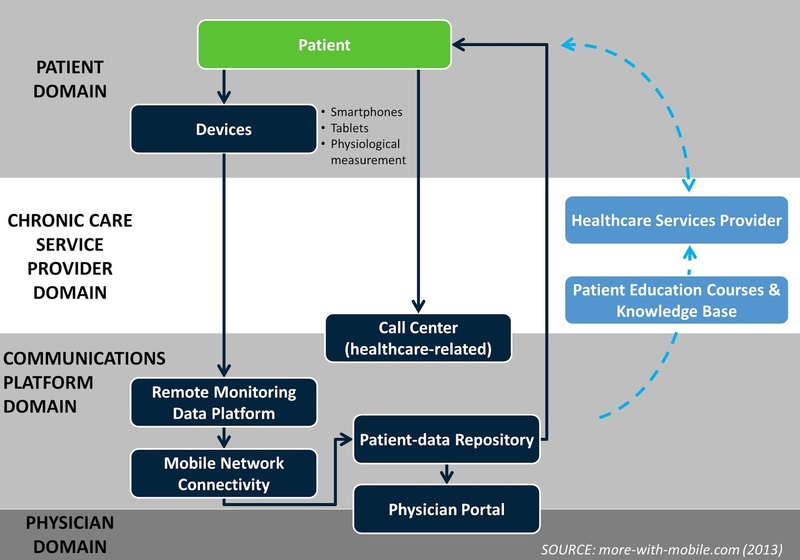 At a micro-level, where mobile operators are currently developing products and services for chronic care patients and their health care service providers, the missing ingredient is about patient education. It's true that mobile technology and remote monitoring help to create the right support environment. However, they are not the main value proposition. Using the simplified service delivery model illustrated below, there appears to be a gap in constructing a valued service offering – within the Chronic Care Service Provider Domain - which could typify the weak demand that O2 Health experienced with its first foray into this market. The value-add of service providers and easily-accessible patient resources can make a huge difference in crystallizing latent demand, fostering sustainable adoption and a willingness to pay. I remember from around 2003 how some operators achieved significant usage and revenue uplifts by showing customers how to use certain features on their new generations of "feature-phone". This illustration also highlights a potential pitfall with remote monitoring solutions in that the information flow can easily become uni-directional. If patient users feel they are contributing data but receiving little or poor quality feedback their incentives for using the system are likely to drop. The conclusion for mobile operators that are developing mHealth strategies is a difficult one. This is not like a conventional mobile access offering. To succeed in this market, there is an under-addressed part of the mHealth service delivery model. It is possible that the gap might be filled by health care service providers seeking to adopt remote monitoring platform solutions. Or, as is the case with many emerging market opportunities, there is an opportunity for mobile operators and other partners in the eco-system (e.g. device suppliers) to orchestrate the market, possibly introducing some of the learning platform innovations that are emerging in the mEducation market. Once the value proposition and service delivery model have been defined, there then remains the issue of payment models - who pays and how much? In the UK, some portion of an annual £3.9 billion budget is addressable and that is just in relation to diabetes. The answers to these questions lead to the issue of how revenues then flow amongst different suppliers in the value chain and this gets into the realms of full business-model design as covered in a previous article.